Nobody is fiddling while the Pacific Northwest burns in an unprecedented and devastating ‘ring of fire.’ Roughly 1 million acres of forest is currently ablaze in 21 separate wildfires in Washington and Oregon – the most the region has seen at any one time in recorded history. The fires were set off by the perfect storm: A wet spring was followed by severe drought conditions and then lightning passed through the area about a week ago. The biggest fire of the bunch, dubbed the Carlton Complex, is the largest in Washington’s history and has already consumed an area of northern Washington three times the size of Seattle. It’s currently just 52 percent contained. The Pacific Northwest isn’t bereft of forest fire fighters, yet 9,000 additional personnel have been brought in from as far as Illinois and Mississippi to help battle the blazes. And President Obama has asked Congress for a whopping $615 million in emergency funds to help fight the western forest fires that even the president himself says are connected to climate change. “A lot of it has to do with drought, a lot of it has to do with changing precipitation patters and a lot has to do with climate change,” Obama said at a political event in Seattle, as quoted by the Associated Press. 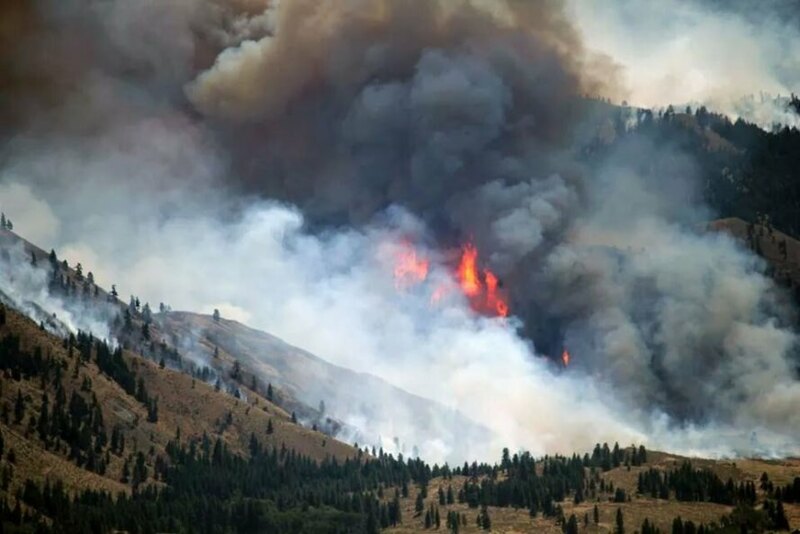 According to CNN, in Okanogan County near the Canada-US border in Washington, one person has died while trying to protect his home from the blazes, while two were arrested for arson after setting backfires to protect their property. Okanogan County Sherriff, Frank Rogers said more than 150 structures have been lost to fires in his area and he expects that number to go up. “I’ve been here 30 years, never seen anything like this,” Rogers told CNN. The Carlton Complex fire has burned an area three times of Seattle. 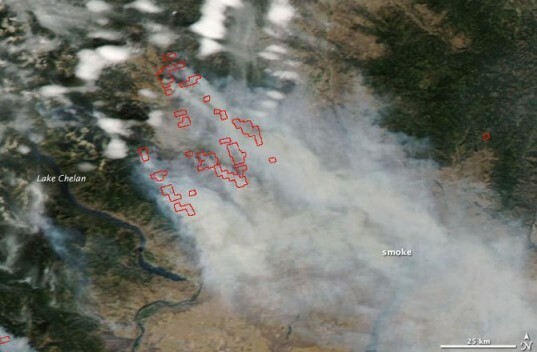 A NASA satellite image of the Carlton Complex fire.